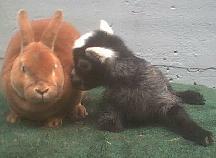 Windfall's Champ, Eden's Gate Farm & Dragon's Lair Rabbitry's newest buck addition visiting with an old neighbor. We welcome you to Rabbit Warren, The Magazine! We are a new magazine for Rabbit owners of all kinds, with special information included for those living in the Pacific Northwest. Volume 1, Issue 2 is now online! We want articles, classifieds, links, poetry, pictures, and more from you! Please help make this new magazine a large and thriving one that everyone will enjoy! Buy or sell by shopping at our free rabbit related classified ads! Place your ad for free by clicking on the link below. Communicate with other rabbit owners, get advice, and more on our rabbit forums! Click on the link below to enter. Submit your rabbit related website for free by clicking on the link below! Meet new friends in our live chat room by clicking the link below! Tell your friends about us by using the link below!